A little while ago, I bought Subliminal Recorder X1 (SRX1). It’s a fun program to use. But it has some important flaws. Let start with the good side. Subliminal Recorder has a lot of features that will allow you to create your on subliminal WAV file. The program comes with an easy to follow manual within minutes you will be able to create your subliminal recording. They are fourth audio channels but in reality will be able to use only 3 of them. The fourth channel was created to have the possibility to build playlist. 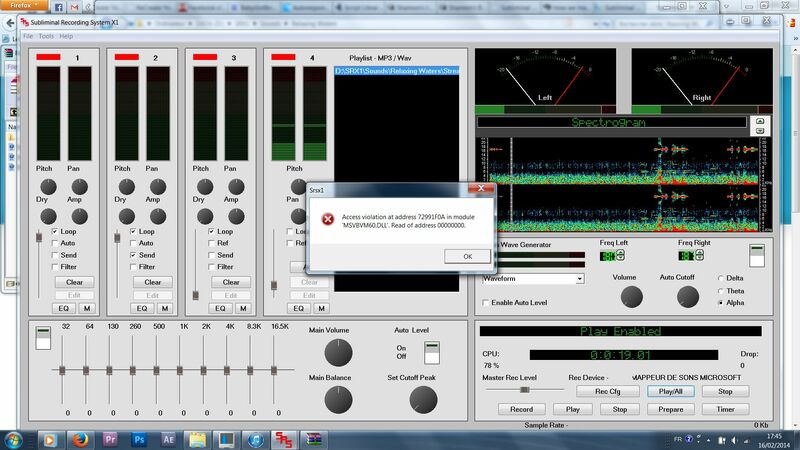 However, each time I tried to use that fourth channel the application crashed . It is easy to create subliminal audio-files with this program. You can load your own. WAV file to the program or you can directly record audio from SRX1. I choose to load my own audio file. If you do that make sure that you use 16 bits PCM WAV files, SRX1 will not accept 32 bits WAV files. 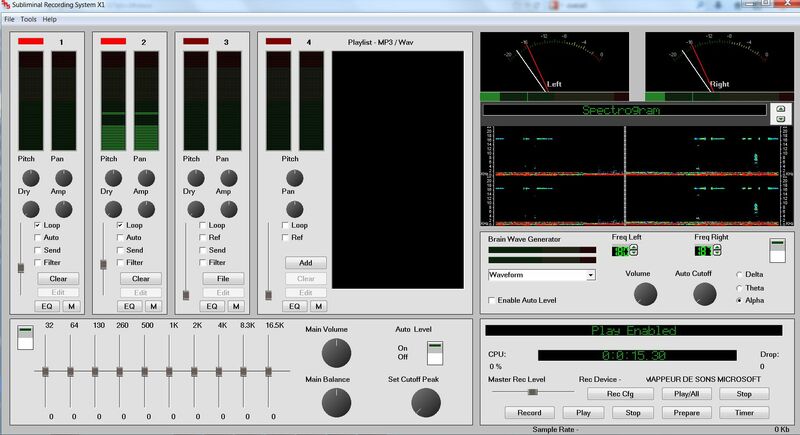 SRX1 has an integrated wav/mp3 editor. You can use it to trim your file, remove noise, add effects such as echo, reversed speech, fadeIn, fadeOut, amplify and much more. 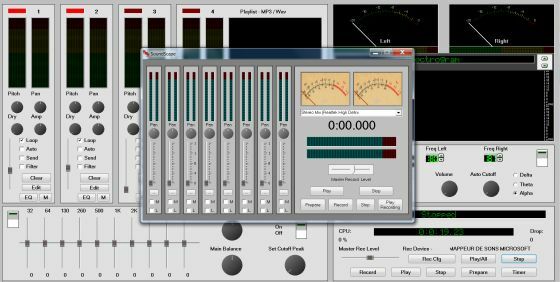 It is very useful if you also use another tool provided with SRX1, the soundscape creator. I usually experiment with creating various soundscapes then in the wav editor, I add a fadeIn effect, and I trim the file if it is too long. So basically, you can put your recorded voice on one channel and your soundtrack on another channel. SRX1 comes with a huge library of sound files and background musics so there is no need to look someplace else for that . But, if it is not enough as a user of SRX1, you have access to subliminalaudiocenter.com to download more sound and music files. SRX1 allows you to create ultrasonic subliminal. It means that the channel with your voice will be modulated at a frequency between 15 Khz and 20 Khz to create a so-called silent subliminal. You can adjust the modulation rate in the option. I personally use 17,5 Khz rather than the default 16,5 Khz. There is a brainwave generator integrated to SRX1 and you can use it to create file with Alpha, theta or delta brainwaves. There’s not the possibility to create a vocoded file to have a masked subliminal like the subliminal sold by Inner-Talk but despite that SRX1 is a nice little program fun to use. I recommend it, if you are a beginner with creating subliminal audio. There is text to speech functionality but I didnt use it. There are also a series of subliminal scripts ready to be loaded in the text to speech editor. I do not recommend that you use them as these scripts are written in a way that are likely to cause resistance. The most important part of working with subliminal is to create a coherent script. I recommend you read books by Eldon Taylor or any book on self-hypnosis to learn to do that. The biggest flaw of SRX1 is the way audio file are recorded through your computer “stereo mix”. So it means that if you create an one hour audio, it will take SRX1 one hour to encode it into a wav file. If you play a Youtube video or something else while encoding your final file, the sound of that will be in your final audio file. Which is clearly annoying. Thats really a problem so while encoding your file , please, do not touch your computer. Once, you have a wav file you can re-encode it in mp3 or OGG file format using the integrated converter. Overall SRX1 is a OK subliminal creation package good for people who know how to create their own scripts and who are motivated to that. The advantages of SRX1 are the ease of use, everything in one place, the large sound and music files library, ultrasonic and brainwave functionalities. The disadvantages are some bugs and instability issues, the way final mix are encoded, no vocoding. Hematite: Love stone or not ? You spent a lot of time focusing on the software. But can you tell us of the results? Yeah I think you signed up with their affiliate program. http://subliminalrecorder.com/affiliates.html Honestly, not too impressed by your blog here either. Let’s face it, you have monetized links to websites so that people who click them have to sit through an ad just to get to the website. It comes off as far from professional. 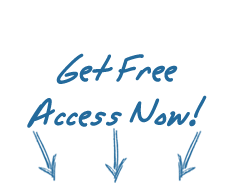 If you are really doing well, you would not have to use such a cheap and annoying means to generate additional income. I have purchased this software and it does not work. I have attempted contact 5 days and all I have gotten is the automatic response stating they will have a reply within 24 hours. NO RESPONSE TO DATE.